Fattitaliani.it: Bruxelles, martedì 8 maggio incontro su "Cibo-una storia di incontri e scambi europei"
Bruxelles, martedì 8 maggio incontro su "Cibo-una storia di incontri e scambi europei"
Ingresso libero. Per registrarsi inviare una mail a: historia-learning@ep.europa.eu. Martedì 8 maggio dalle 18 alle 21,30 alla House of European History. 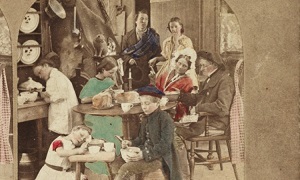 Join us to discuss this everyday-life topic with food history and anthropology specialists, on the occasion of the last month of the House of European History's first temporary exhibition "Interactions". This event will take place in English, French and Dutch.